Have a question for Green Verde Resort Cottages? There are non smoking rooms, balcony/terrace, desk in each of the hotel's well-equipped rooms. To make each guest's stay more complete, this Palawan hotel offers laundry service/dry cleaning, family room, shops. Guests may make use of the hotel's excellent recreational and leisure facilities including massage, garden. Convenient location, a dedicated staff and first-rate facilities make Green Verde Resort Cottages a favorite among travelers. -Generator electricity supply is only available from 6PM to 11PM. Additional charges will apply if guests request for additional hours of electricity at the guesthouse. -The resort doesn't have hot water facility. Very basic facilities with friendly staff and good food. Was definitely overpriced though. I paid $50 for the night when the price should have been closer to $20. The staff is nice and friendly, the hotel restaurant is one of the best in the area, you can chose from a variety of breakfast, the ocean is just in front of the hotel, you can see and hear the ocean from your room. A filthy dark small bamboo construction beach hut, no aircon, electricity and fan work only 4 hours a day, the trickle of water was cold, was a rip off. No staff on premises in the morning until 8 am; we wanted to leave early to visit the underground river but had no chance. Breakfast was basic. Stay away! Friendly staff with good local knowledge. Limited menu but close to other restaurants and bars. Basic accom. A bit pricey for what you get.staff can help you arrange lots of activities. My daughter and I stayed at Green Verde which is very near the venue of my niece's wedding. It is also near the jump-off point to the underground river. Although facilities were very basic and should have costed less than what we paid for, the lodging place's slot to the underground river allowed us to go to the river at very cheap rates (compared to those offered by travel agencies in the city. The staff were helpful and friendly. Green Verde was great in getting us into the undergruond river even though we hadn't made any bookings before going to Sabang (though many online posts said this was necessary). The facility was very basic but pretty clean. Some bugs but nothing terrible. Not too much to do in Sabang, not much choice for food, but it was a nice place to do nothing on the beach for a day or two. Green Verde Cottages are situated right on the beach at Sabang. The roar of the ocean at night provided great sleeping conditions. The cottages are very basic - bed, cold shower, toilet and not much else - a bit like camping. We had a family room, with two queen size beds, so we had more than we needed. It was a good standard room. No hot water! We celebrated New Years 2012/2013 but everything was closed because of holidays, both restaurants and the underground river tour. So if you are there for this season, don't expect any celebration or tours. The restaurant at the hotel was open for staying guests though, and it is a fine restaurant. Bring cash as there are no ATM in the city or near. This hotel is right beside one of the well-known hotel (5 star). You get the same beach front without the 5-star amenities. Nice simple cottages and home-made breakfast. It was raining hard during our stay and some part of the resort is flooded so they had to move us to a different hut. The port for the Underground River is a couple of blocks walk. The resort I think is family-owned. staff were very nice and accommodating. Green Verde is not for everyone. If you would like to get peace and quiet and get close to nature then go ahead but if you expect to be treated like royalty then go somewhere else. The price was reasonable since they had to use a generator for electricity which you only get at night. the bungalow good to stay but the toilet was not flushing and the shower had no hot water.the electricity start at 6pm till 10pm only. Stayed in the family room and extended our stay by 1 night. Fan only and electricity is supposed to go off at night but didn't. Great staff, simple room with private bathroom. Mosquitos are a problem coz its hard to see in the rooms without electricity so buy bug spray from the store and leave door open. Rooms were bamboo huts with thatched roof overlooking the beach. Green Verde restaurant food good but very slow like all the other restaurants. We had breaky one morning at the Sheridan and the eggs weren't cooked and the omelette was disgusting. Disapppointing for 4 star hotel. nice & relax trip. underground river is attractive. 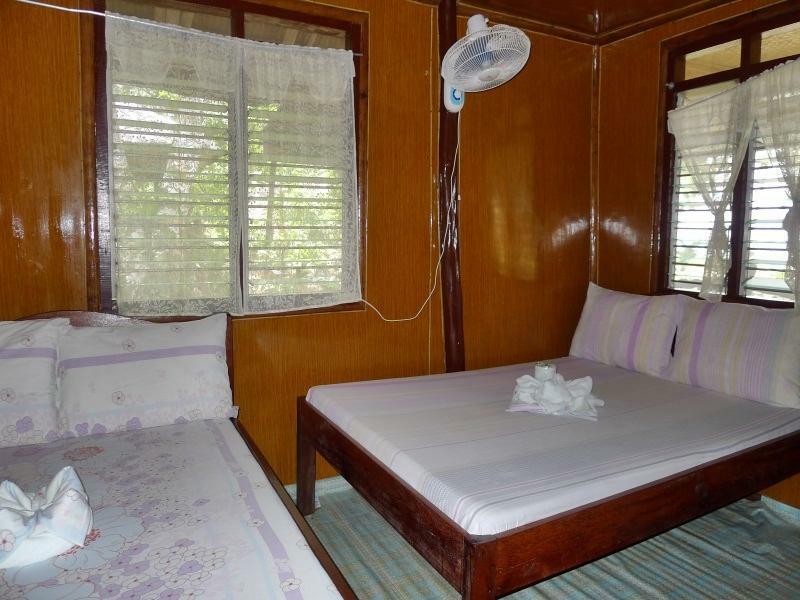 the green verde cottages are your standard beach bungalows, clean and basic, meeting our expectations. beds and pillows were really comfy, staff are friendly and accomodation. the resort is located right in the middle of sabang beach, an easy walk to the minivan transport and either end of the beach. very basic and small cottages close to the beach.good enough for the money you pay though.very very nice waitress at the restaurant! The hotel was really really close to the beach and surrounded by others in a quiet but funny location! The food at their restaurant is great and the staff is very friendly. The rooms are not fancy, but pretty cool for this kind of trip! Cute bungalows with balconies over the beach! Très déçu concernant la réservation, nous n'étions pas attendu à l'hôtel. On nous a proposé un bungalow très médiocre... il ne correspondait pas du tout à l'offre prévue dans la réservation. Le point idéal c'est qu'il est a deux pas de la mer. Je ne conseil pas du tout cet hôtel.